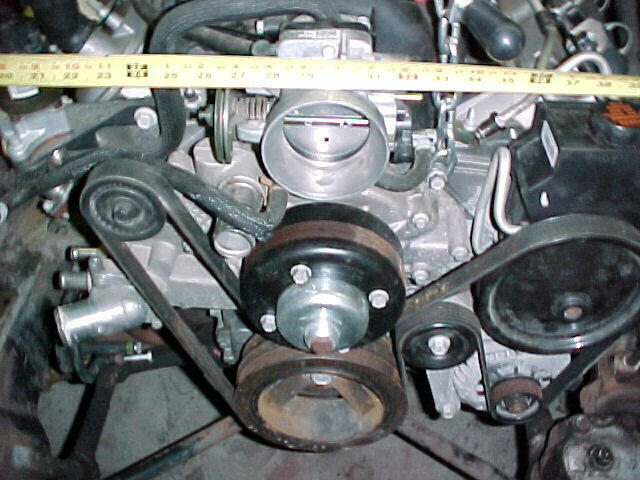 The L69 motor mounts (dimensions to inside of "clam shell" bolted to block) sit between 14" and 18" as referenced from the back of the block. 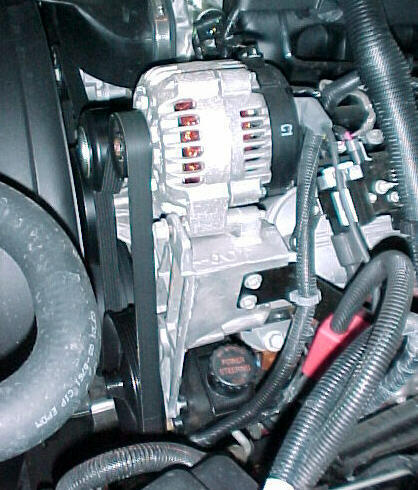 The measurements from the back of the LS1 A/C compressor to the back of the block are 16-1/2" and the Alternator is 17-3/4". Unless I can find another A/C compressor or look at relocation, the motor will have to sit about 2" farther forward than the L69. I don't like this from a weight transfer standpoint! 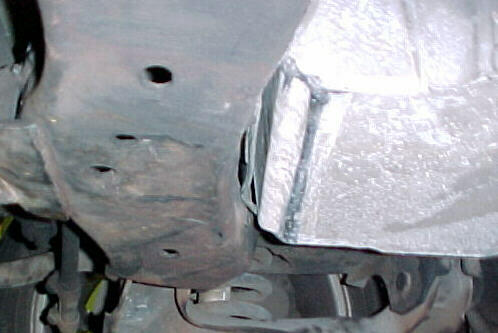 The oil pan does not clear the rear frame saddle by about 1/2" preventing the motor from fully "seating" to the proper angle. 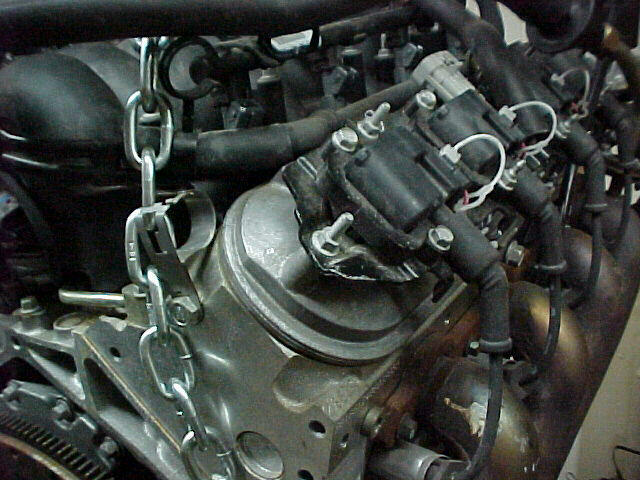 The motor cannot slide back toward the firewall any more due to interference between the back of the A/C compressor and the front of the frame saddle. This is fixable I hope! I will order a truck LS1 pan tomorrow to solve this problem since I want to do everything possible before taking the cutting torch to my baby! 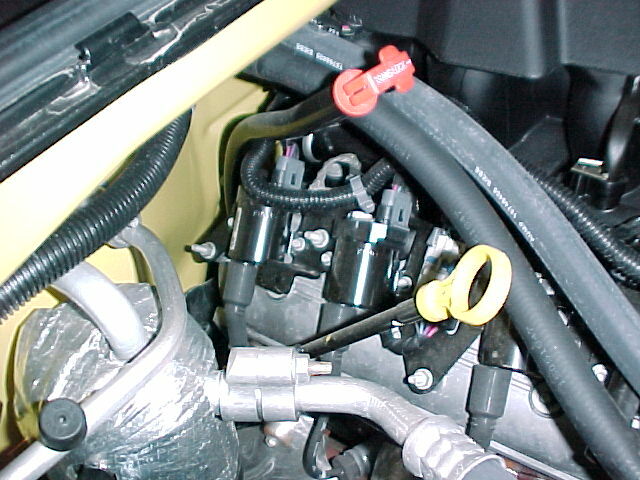 The #8 plug wire (as it comes off of the LS1 coil pack/valve cover) sits right against the side of the Monte's heater-A/C housing. I believe once I get the proper oil pan clearance, the rear of the motor will drop far enough down to just barely provide some clearance here. This is a watch item. 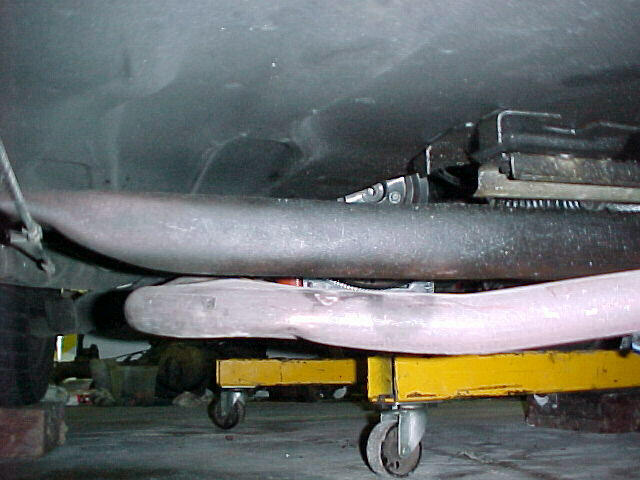 It appears that the stock exhaust manifolds may clear the frame. I did remove the left side Oxygen Sensor from the left exhaust manifold as a precaution since it looked marginal for clearance at the frame. I'll be able to tell better when the motor sits all the way down after the oil pan is changed. On a positive note, the LS1 Alternator and pulley clears the steering box on the frame just fine with what will appear to be about 1/2" clearance! A second positive, even with the motor riding on the bottom of the oil pan at the engine frame saddle, there was adequate clearance to close the hood (although it's obviously off for now!)! Maybe it's just the black intake manifold contrasting against the aluminum motor and black Monte body, but I must say the LS1 looks nice sitting in there! I'll snap a few more pic's during the next test fitting! 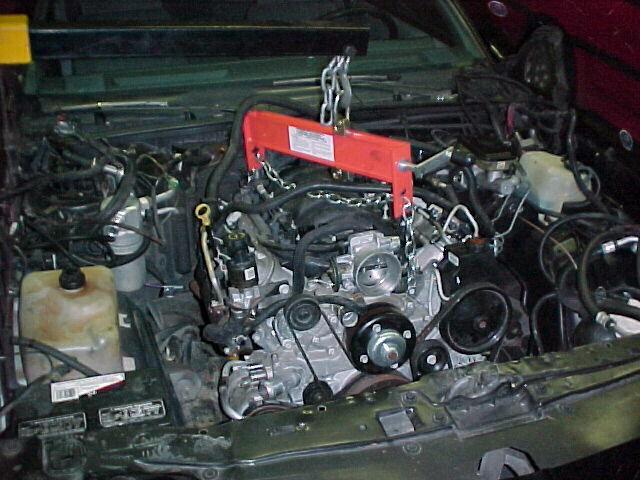 I was able to set the LS1 motor back to within about 1/4" of where the back of the L69 sits. I verified this by placing ink marks on the firewall and taking measurements. I was also able to now set the front and rear of the LS1 motor (as measured by the C/L of the crankshaft) to the same height as the stock L69. The rear of the LS1 F-body oil pan will now clear the rear side of the engine frame saddle by close to 1/2". Actually with the front of the motor set to my reference dimension (~ 4.5" to the crank C/L above the front sway bar) the entire oil pan actually clears the entire engine saddle, very close at the 2nd hump in the oil pan though (about 1/4 to 3/8" clearance). Still too tight for me. I went ahead and ordered the LS1 truck oil pan, windage tray, and oil sump today from Shaun Carter at SMC Performance for $100 shipped. The passenger side coil pack mounting bracket and #8 spark plug wire continues to be a problem even with the motor located back further and set at the proper height. The coil pack bracket actually punctured a small hole in my plastic A/C-heater cover shroud on the firewall due to weight of the motor unintentionally leaning on it. 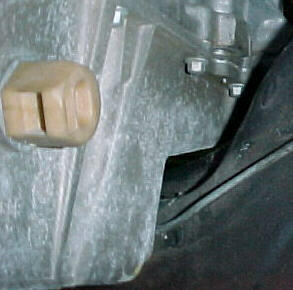 The top outside boot of the #8 spark plug wire at the coil pack still rubs the side of the A/C-heater cover shroud too. It appears that if the motor could drop another 1/2" or so, it may actually clear this area due to the underside slope of the A/C-heater cover shroud. 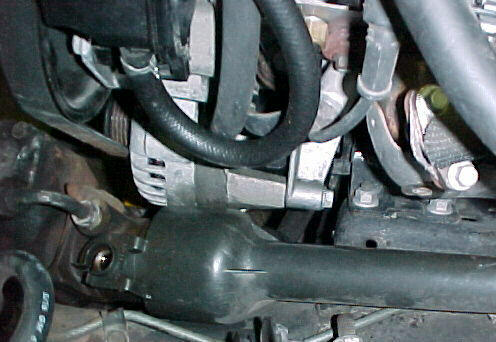 The alternator and bracket still clears everything with reasonable clearances to the frame and steering box at the frame (about 1/2" at closest points). What's really odd is that when I measured the C/L of the SBC between the front fenders it actually sits about 5/8" closer to the passenger side than the drivers side (very interesting!). 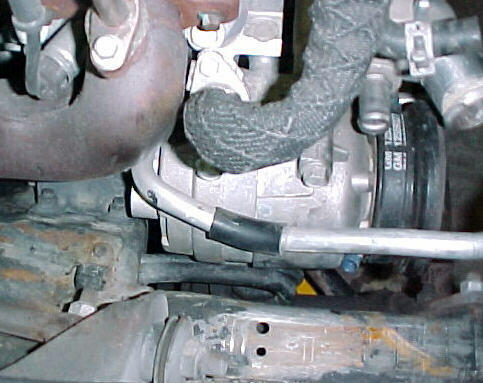 My reference measurement from the passenger side fender to the front of the water pump pulley C/L was ~ 29-5/8". 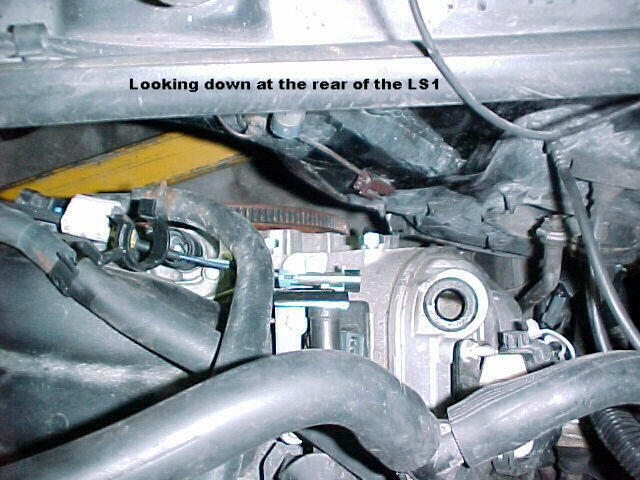 Click here for a pic of the LS1 centered to this measurement. The stock exhaust manifolds fit just fine, however, the drivers side LS1 Oxygen Sensor located in the exhaust manifold will not clear the frame. Clearance is only adequate for about a 2" long sensor. I may need to determine if a "shorty" sensor is made to clear here. 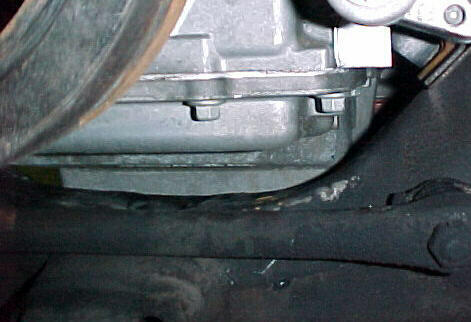 The stock LS1 "Y-pipe" will clear up front, however, the drivers side pipe hits on the bottom of the cross-member (just barely because the pipe is so flat!). The left side catalytic converter clears the frame okay (about 1/2") and the Monte Carlo stock fuel vapor return line actually touches it (since it sits off of the frame). This vent line could be relocated slightly for adequate clearance. 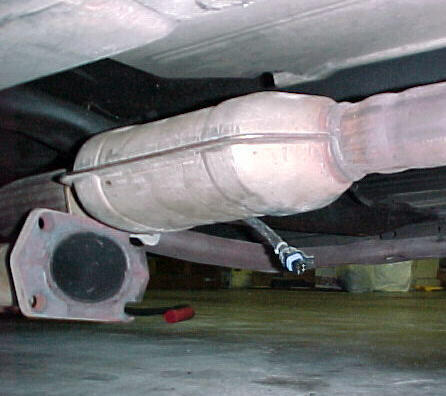 The right side catalytic converter fits in the exact stock location of the L69 converter. 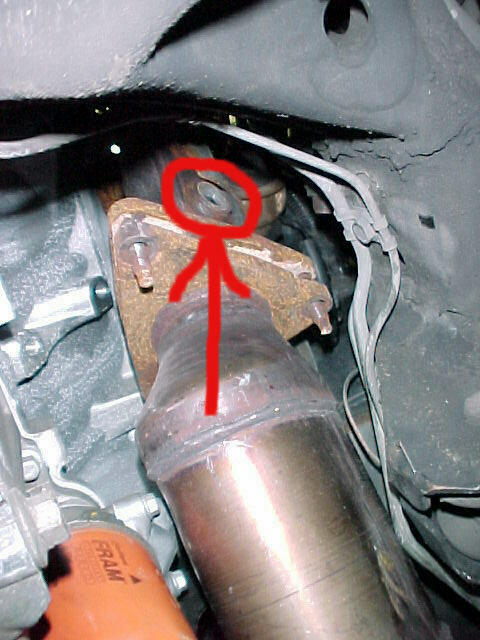 The stock LS1 "Y-pipe" outlet is just to the right side of where the Driveshaft will be (the Driveshaft is currently out of the car so it may be tight! 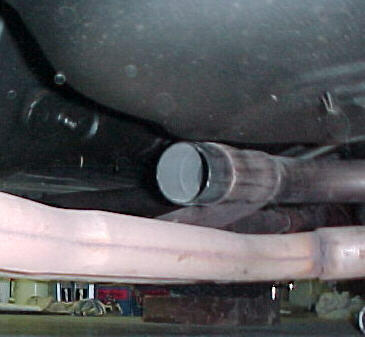 ), basically in the same location where the stock L69 dual exhaust pipes split in two under the Driveshaft as they go back to the mufflers. 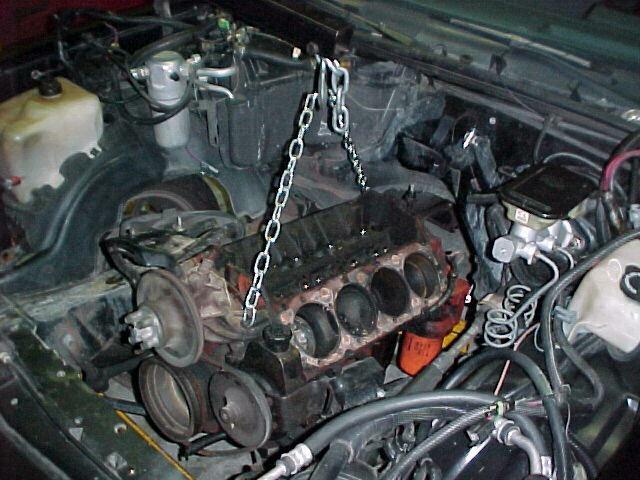 I believe if I try and re-locate the LS1 forward by about another 1/4" (making it sit 1/2" closer to the front of the car versus the L69) and set it down about another 1/2" (hopefully with the aid of the LS1 Truck oil pan) I believe the passenger side coil pack bracket and #8 spark plug wire clearance problems will be solved. As a last resort, I can also trim the coil bracket on an angle to match the A/C-heater cover shroud and try to re-locate the coil pack slightly, however, I want to first try to locate everything with factory components untouched and no torches cutting the frame! I can also center the motor in the engine bay for additional passenger side clearance (remember I mentioned above that the L69 sits ~ 5/8" offset from the body C/L) and may consider moving it slightly to the drivers side anyway to keep the weight balancing similar to stock. I will have to research this more to understand the ramifications of this. I will also be contacting Street & Performance to determine if I can get the proper LS1 passenger side high mounting brackets for the A/C compressor. I am pleased to say at this point that it looks like the frame clearance will be okay everywhere with the LS1 truck oil pan! Swapping of the pans shortly will verify this. The truck pan sits about 3" lower overall which means it is out of the question for this swap unless it is severely modified (and I don't want to do this!). I called SMC Performance and cancelled my Truck oil pan order. 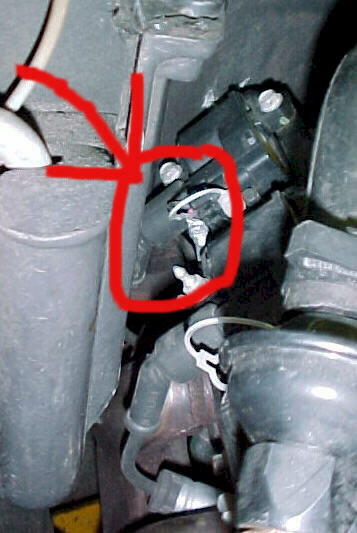 While closely observing the Truck accessories bracketry (alternator in particular since it is different than the F-body) and coil bracketry I did notice that the Truck passenger side coil bracket (#8 coil and plug wire in particular compared to the F-body) were located about 1" closer to the intake manifold! This would allow the needed clearance here I have been looking for! 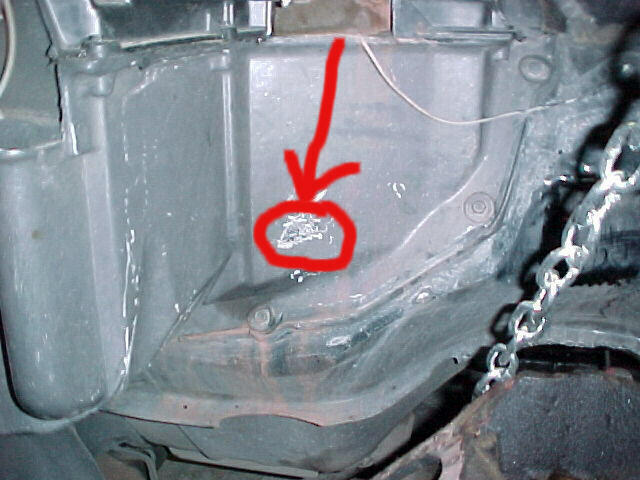 While I was on the phone with SMC Performance about the oil pan situation, Shaun mentioned that the coils are not interchangeable between Truck & F-body on the brackets. He will investigate several proto-type brackets he has to see if he has a match that will work here. 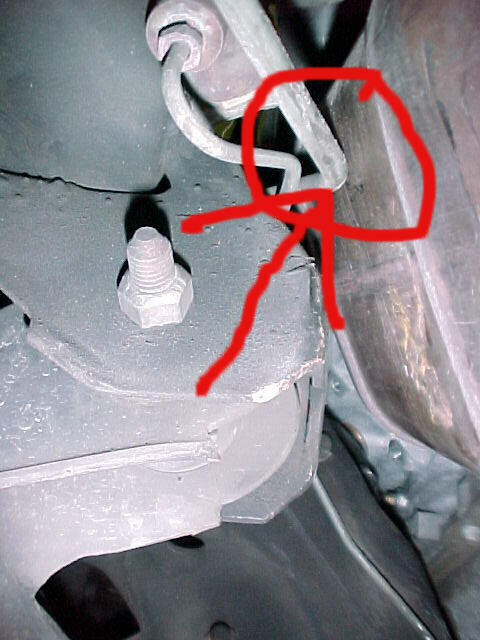 Worst case, I will modify my coil bracket (at the #8 coil) for adequate A/C-heater cover shroud clearance.